Rose & The Thorns are a fun band based in “The Heights” area of Houston, Texas. We believe in promoting live music and play mostly for fun but if we can make a buck or two now and then that is O.K. with us. We don’t take ourselves too seriously, it’s not like we are going to make “The Big Time” anytime soon! We do however play Folk and Traditional music that is suitable for most venues. We keep the volume down so that people can converse normally. The band is compact, so we don’t require a lot of room for set up. We play a lot of private parties and charity events so our music is clean cut although some of the songs we play are a bit odd! All of us have at least 20 years playing experience and some of us more than that! Rose & The Thorns have been together for nearly four years and so far, we have never had a bad gig. Knock on wood! We don’t profess to be Super Stars but we do have a nice pleasant sound with good vocal harmonies and a pleasing instrumental sound. 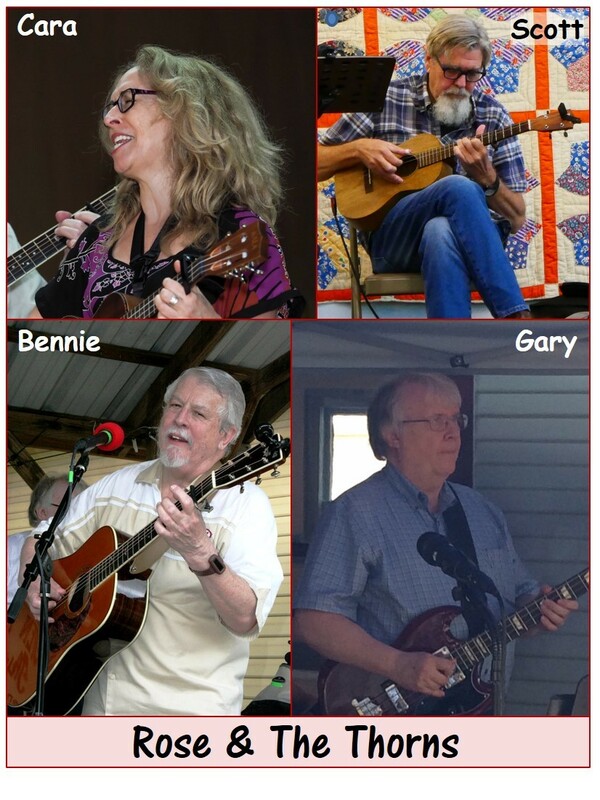 All of us have played in various musical groups over the years. We never play venues that are over our heads or beyond our abilities. Rose & The Thorns value fun over fortune! All of us are “Oil Patch” professionals either retired or presently employed. If you are looking for a band that will make your event fun and lively then we are for you. Cara – Vocals, Mandolin, Violin and Ukulele. the lead ukulele, which is amplified slightly.